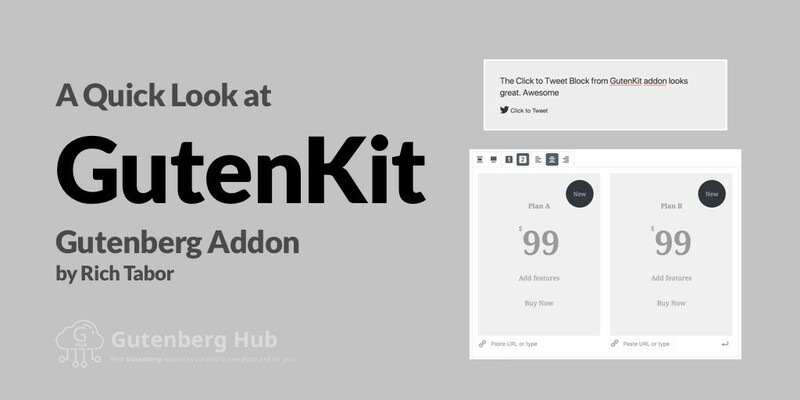 GutenKit is an upcoming suite of Gutenberg Blocks designed to help you build better landing and sales pages within Gutenberg. The plugin is currently being developed in sperate individual block plugins. that that this plugin right now is in development and not adviced to use on a live website. This block allows you to easily add vertical spacers to space out your blocks/content within the upcoming Gutenberg editor. This block works perfectly already and you can start playing with it just now. This block allows you to easily add a customized tweetable content for your readers. Click to tweet block make it simple for the reader to share on Twitter. This block also seems to work fine out of the box just now, however, improvements and update are sure to come. Another great block you get with GutenKit is a nice looking customizable Pricing Table block. This block makes it easy to create and publish beautiful pricing tables on your WordPress site. This block seems not functioning perfectly just now, however, have pretty good customization options already and looks promising. Using this block you can add social media icons to your site/page to enable sharing. This one currently looks not complete enough to even play with it. It contains only facebook and twitter share buttons. And missing customization options. Obviously, this whole suite of blocks is being developed at the time I am writing this post. It will get updated in coming days eventually. This block will eventually allow you to add a nice looking portfolio to your WordPress website.